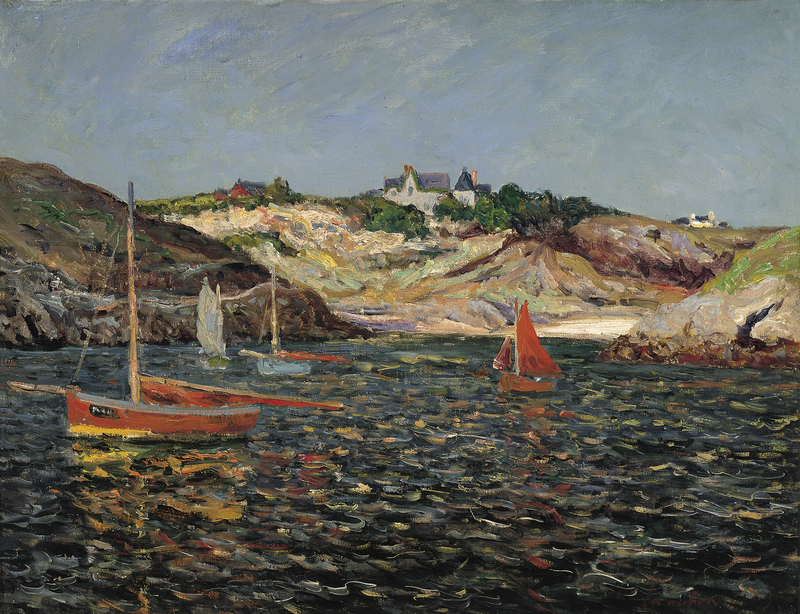 This luminous painting was reproduced in Arsène Alexandre's monographic work of 1926 dedicated to Maxime Maufra. Indeed, this piece is representative of the artist's talent. Maufra, who was essentially a landscape and seascape painter, worked in Paris and Normandy, but above all in Brittany, his region of origin. 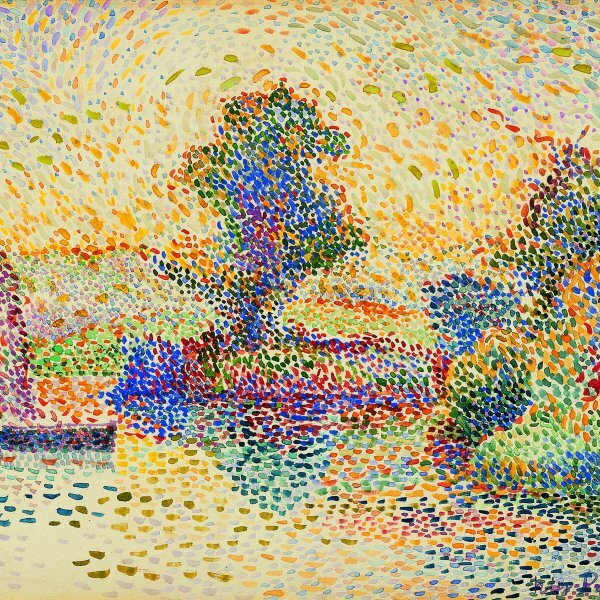 He was born in Nantes, but he only started devoting himself exclusively to painting in 1890, the period when he met Paul Gauguin and Paul Sérusier in Pont-Aven. In those days, that village attracted French and foreign painters, seduced by a region with intact landscapes, and customs and beliefs still considered "primitive". Maufra also met Henry Moret and Gustave Loiseau, who became his friends. 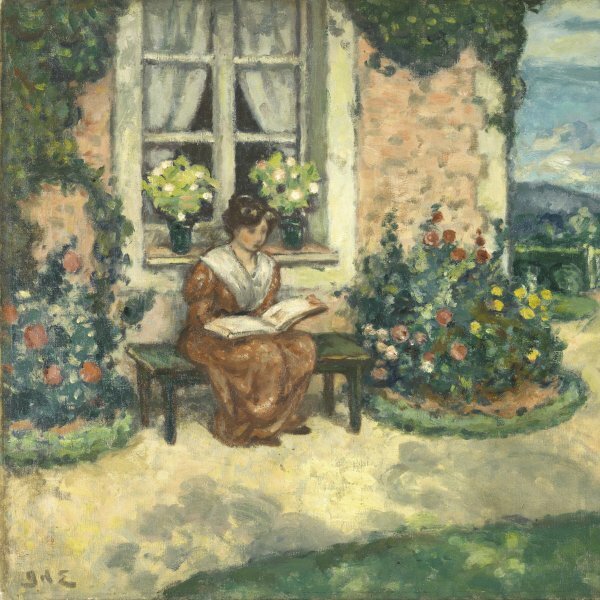 Like them, he painted Impressionist landscapes strongly marked by the art of Monet and Pissarro, and like them he was represented by the Durand-Ruel gallery, with which he was linked by a contract from 1894. His works and those of his friends therefore belong to the second generation of Impressionist artists. 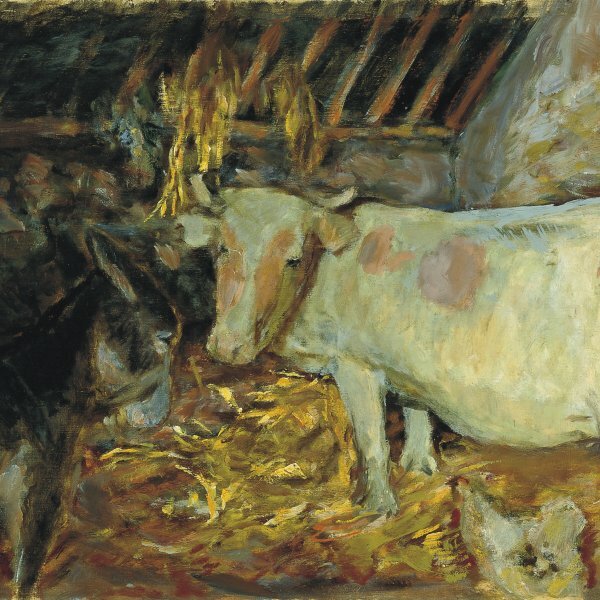 In 1903, Maufra settled in a thatched cottage in Kerhostin, near Quiberon. From that period onward, he explored the region, in particular towards Belle-Île-en Mer. In Belle-Île, the artist exploited all the resources of the area. He painted several times Port-Goulphar, represented here (a picture with the same subject is exhibited at the Musée des Beaux-Arts in Rennes), but also the port of Palais, the beach in Port-Donant and the small port of Sauzon. The artist evokes the almost wild character of the island, where we can see three modest fishermen's houses and a small beach which serves as a natural port protected by the rocks projecting forward, apparently without having been placed there on purpose. In the foreground, four fishing boats have been anchored, and the artist has clearly enjoyed depicting their colourful sails. The composition, of great simplicity, has a strong Impressionist character, as if it had been improvised. In October 1886, the same place on the Côte Sauvage-situated not far from the famous peaks of Port Coton-had already seduced Monet. This artist had painted five views of Port-Goulphar in calm weather and five views in bad weather, which testify to the dramatic violence of the tempest he had witnessed on that occasion. Nothing of this sort in the picture analysed here, painted in good weather: some boats have their sails rolled up, the dark water has a regular lapping and the cloudless sky presents no menace. Here Maufra shows himself to be a powerful painter of seascapes, sensitive to the brightness of the colours which he observes with as much modesty as sincerity. As he wrote in his Souvenirs, "My personal inclination was to link style and nature. As a landscape painter, I painted all that affected me, examining nature closely, trying to render the character of everything that attracted me and to put into my work the emotion I felt."